This outstanding example of a 2008 Lexus RX 400h is offered by Okaz Motors. How to protect your purchase? CARFAX BuyBack Guarantee got you covered. This SUV is a superb example of what a tough, work focused vehicle should be. Exceptional towing, acceleration and torque will help you get the job done. Indulge yourself with one of the most highly crafted, most luxurious automobiles available today. This Lexus RX 400h features AWD. That means power and control delivered to all four wheels for maximum grip and improved handling. The RX 400h has been lightly driven and there is little to no wear and tear on this vehicle. The care taken on this gently used vehicle is reflective of the 78,675mi put on this Lexus. 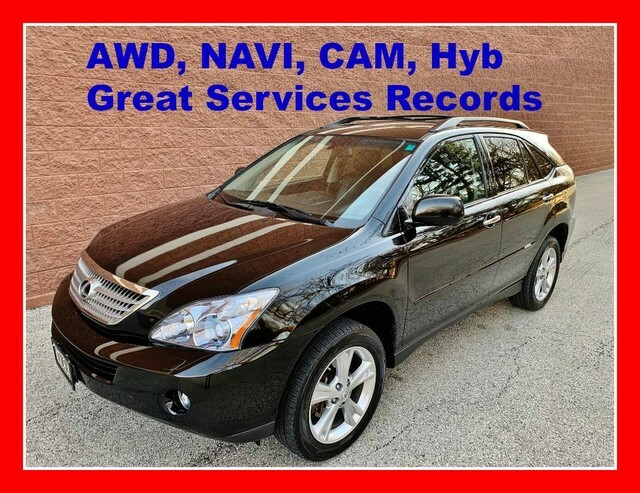 With all records included, feel comfortable knowing that the history of this Lexus RX 400h is provided in order for you to make a knowledgeable decision. Beautiful exterior. Clean interior. This Lexus RX 400h is so immaculate it is practically new. Treat yourself to a Lexus RX 400h that's got it all. Nearly every option is packed into this beautiful ride. Added comfort with contemporary style is the leather interior to heighten the quality and craftsmanship for the Lexus RX 400h Take the guesswork out of where you are going with the top-tier navigation system found on this exceptional Lexus RX 400h. With new tires, this vehicle is ready for miles and miles of driving. More information about the 2008 Lexus RX 400h: The 2008 Lexus RX350 and RX400h offer the comfort and refinement of luxury cars, combined with the spacious, versatile interior of utility vehicles. Several high-tech features are available--like adaptive front lighting--that aren't widely available in its class. The RX400h especially, with its advanced hybrid powertrain, stands out for its high fuel efficiency and 27-mpg city rating. The models also have a very strong reputation for quality; for 2007, the RX was the highest-rated midsize premium multi-activity vehicle in the J.D. Power and Associates Initial Quality Study (IQS). Strengths of this model include ride and refinement, Comfort, available technology features, safety, and fuel-efficiency (400h).